Berlin, Gemäldegalerie, inv. I. 493 (468). Charles Nicolas Cochin after Watteau, L’Amour au théâtre français, engraving, c. 1734. The painting was engraved in the same direction by Charles Nicolas Cochin, c. 1734. It was announced for sale in the May 1734 issue of the Mercure de France (p. 940) and was issued together with an engraving after its pendant, L’Amour au théâtre italien. Henri de Rosnel, owner of the painting, had the right to publish this and the pendant engraving for six years. Paris, collection of Henri de Rosnel (d. 1739, textile merchant and échevin de Paris). His ownership is acknowledged in the caption of Cochin’s print: “du Cabinet de M.r de Rosnel.” It is also cited in the announcement of the print in the Mercure de France: “du Cabinet de M. de Rosnel.” The picture passed to his wife, Marie Thérèse Marsollier (d. 1752). Berlin, collection of Frederick II [Frederick the Great] (1712-1786; king of Prussia). It was acquired in Paris between 1763 and 1766, and was recorded in the Österreich plan of 1766 for the hanging of the pictures in the royal collection. It was transferred to the Sans-Souci Palace in Potsdam in 1769 and remained there until 1830 when it was moved to the Royal Prussian Museum in Berlin. Paris, Musée Carnavalet, Le Théâtre à Paris (1929), cat. 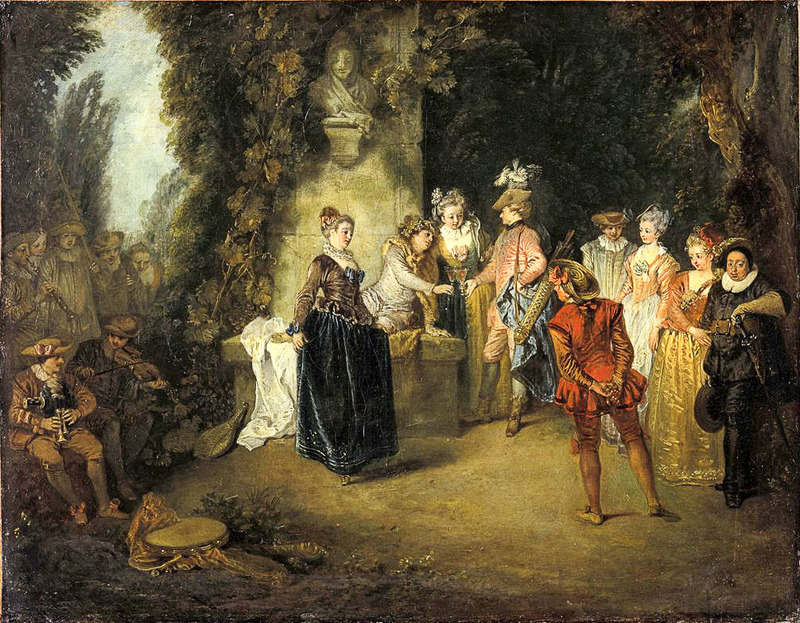 76 (as by Watteau, L’Amour au théâtre français, lent by Berlin, Kaiser Friedrich Museum). Paris, Palais national, Chefs-d’oeuvre (1937), cat. 229 (as by Watteau, L'Amour au théâtre français, lent by Berlin, Kaiser-Friedrich Museum). New York, Metropolitan Museum, Paintings from Berlin Museums (1948), cat. 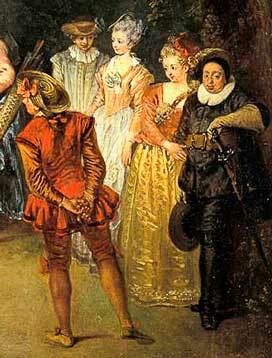 141 (as by Watteau, The French Comedians, lent by the Royal Collections). Wiesbaden, Landesmuseum, Französische Kunst (1951), cat. 51 (as by Watteau, Die französische Komödie, lent by Berlin, Gemäldegalerie). Paris, Petit Palais, Chefs-d'oeuvre de Berlin (1951), cat. 57 (as by Watteau, L’Amour au théâtre français, lent by Berlin, Gemäldegalerie). Munich, Residenz, Europäisches Rokoko (1958), cat. 221 (as by Watteau, Die Französische Komödie (L’Amour au théâtre français), lent by Berlin, Museum Dahlem). Berlin, Schloss Charlottenburg, Meisterwerke (1962), cat. 95. (as by Watteau, Die französische Komödie, lent by Berlin, Ehem. Staatliche Museen, Museum Dahlem). Versailles, Château, La Comédie-Française (1962), cat. 133 (as by Watteau, L’Amour au théâtre français, lent by Berlin, Ehem. Staatliche Museen, Museum Dahlem). Bordeaux, Galerie des beaux-arts, Arts du théâtre (1980), cat. 69 (as by Watteau L’Amour au théâtre français, lent by Berlin, Ehem. Staatliche Museen, Museum Dahlem). Frankfurt, Städelsches Kunstinstitut, Einschiffung nach Cythera (1982), cat. Ce 8 (as by Watteau L’Amour au théâtre français, lent by Berlin, Staatliche Museen Preussischer Kulturbesitz, Gemäldegalerie). Braunschweig, Französische Malerei (1983), cat. 34 (as by Watteau, Die Französische Komodie [L'Amour au théâtre français], lent by Berlin Gemäldegalerie). Washington, Paris, Berlin, Watteau 1684-1721 (1984), cat. P38 (as by Watteau, L’Amour au théâtre français, lent by Berlin, Staatliche Museen Preussischer Kulturbesitz, Gemäldegalerie). Copenhagen, Statens Museum, Lyst & Laengsel (2003), cat. 99. Ottawa, National Gallery, Age of Watteau, Chardin, and Fragonard (2003), cat. 5 (as by Watteau Love in the French Theatre, lent by Staatliche Museen zu Berlin, Gemäldegalerie). Paris, Grand Palais, Poussin, Watteau, Chardin, David (2005), cat. 180 (as by Watteau, L’Amour au théâtre françois, lent by Berlin, Staatliche Museen zu Berlin, Gemäldegalerie). New York, Metropolitan Museum, Watteau, Music, and Theater (2009), cat. 7 (as Love in the French Theater, lent by Berlin, Staatliche Museen, Gemäldegalerie). Hédouin, “Watteau” (1845), cat. 77. Hédouin, Mosaïque (1856), cat. 78. Viardot, Les Musées d'Allemagne (1844), 373. Goncourt, Catalogue raisonné (1875), cat. 65. Alexandre, "Ce qui est à nous" (1919), 124. Dacier, Vuaflart, and Hérold, Jean de Jullienne et les graveurs (1921-29), cat. 270. Réau, “Watteau” (1928), cat. 54. 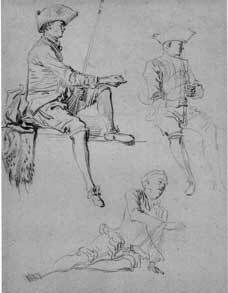 Parker, Drawings of Watteau (1931), 29-30. Adhémar, Watteau (1950), 44, 48, cat. 203. Macchia and Montagni, L’opera completa di Watteau (1968), cat. 187. Ferré, Watteau (1972), cat. A29. Boerlin-Brodbeck, Watteau und das Theater (1973), 143-48. Roland Michel, Watteau (1981), cat. 226. Tomlinson, La Fête galante (1981), passim. Roland Michel, Watteau (1984), 217. Posner, Watteau (1984), 240, 258, 262-63. Rosenberg and Prat, Watteau, catalogue raisonné des dessins (1996), 1: cat. 23, 123, 185. 195-97; 2: 407, 413-14, 495, 539, 569, 626. Vogtherr, Französische Gemälde (2011), cat. B1. Brussels, Palais des beaux-arts, Watteau, Leçon de musique (2013), cat. 17. 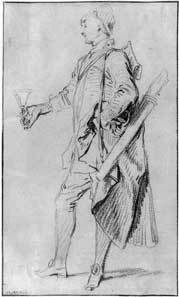 Watteau, Study of an Actor with a Quiver of Arrows, red chalk, 16.5 x 10 cm. Paris, private collection. Watteau, Sheet of Studies of Theatrical Characters (detail), red chalk. New York, Morgan Library & Museum. 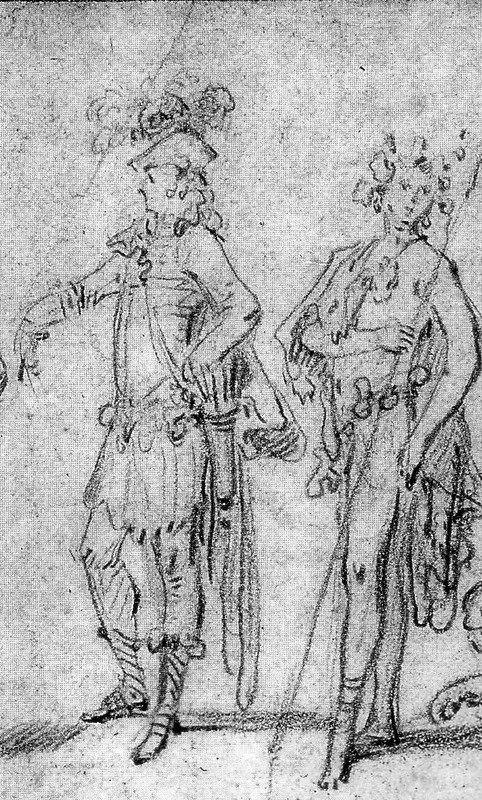 The splendidly costumed archer at the center of L’Amour au théâtre français, often identified as Cupid or Mars, is based on a study of a posed model in a Parisian private collection (Rosenberg and Prat 196). He strikes the appropriate courtly stance; his cape is caught by the quiver of arrows; and one hand, holding a glass of wine just as in the painting, is extended. Yet this actor also recalls a still earlier drawing an early Watteau sheet of studies in the Morgan Library & Museum (Rosenberg and Prat 23). There the costumed actor is one of a series of theatrical figures arranged in a linear progression. The style of the figures and their arrangement on the Morgan sheet recall Claude Gillot’s manner and, like Gillot’s, Watteau's characters seem to be inventions created in the artist’s imagination rather than from life. While the actor in the painting is clearly based on the study from the live model, in one telling detail Watteau reverted to the Morgan drawing, giving the actor a tricorne hat with a jaunty cockade of feathers rather than the simple cloche worn by the model in the later study. Watteau, Two Studies of a Woman Dancing (detail), red chalk. Whereabouts unknown. 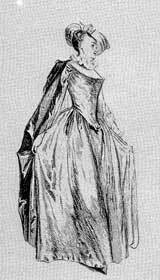 Benoît Audran after Watteau, A Standing Woman (detail), engraving, Figures de différents caractères, plate 74. 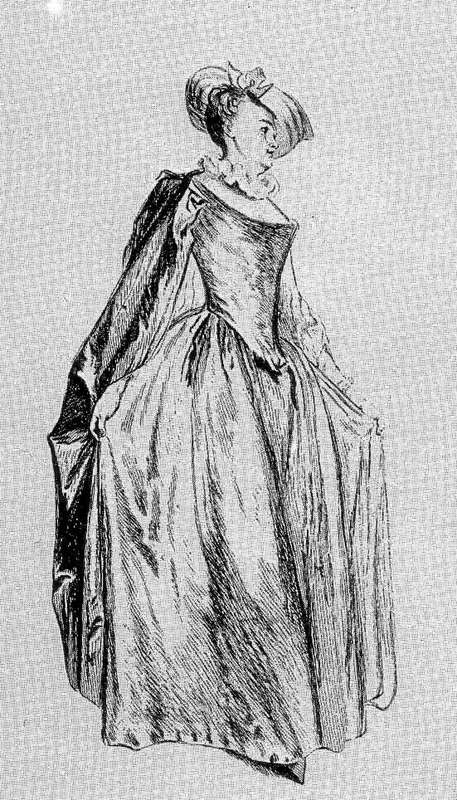 Several drawings have been proposed as preliminary studies used by Watteau for the dancing actress at the left center of L’Amour au théâtre français. Indeed, the artist made many studies of women caught in arrested moments of the dance, their skirts spread out gracefully to each side, and these have sometimes been associated with the painting (Rosenberg and Prat 123 and 185). But these drawings are merely analogous and do not correspond in important details; often the body and head are canted, and the folds of the dress fall differently. One that conforms closely to the figure in the painting is a lost Watteau drawing recorded in plate 74 of the Figures de différents caractères. Here the body is posed more stiffly, the head is more upright and just a degree short of profile, and the essential lines of the bodice and ruff correspond to the costume worn by the actress in the painting. However, the head covering is different, the skirt is extended farther than in the painting, and details of the dress and the position of the right hand are not identical. Perhaps Watteau relied on yet another but closely related drawing. The attitude struck by the central character of Bacchus in the painting—seated and inclined, resting his weight on his left arm—is seen in the bottom study on a sheet in a private collection (Rosenberg and Prat 195). There the model bears none of the attributes of the god, neither the animal skin cape nor the wreath of grapes around his head. 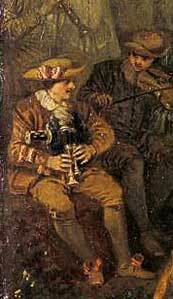 Interestingly, at the top of the same page is a bagpipe player who very much resembles the instrumentalist in the painting, although there are notable differences in the way he fingers the pipes. 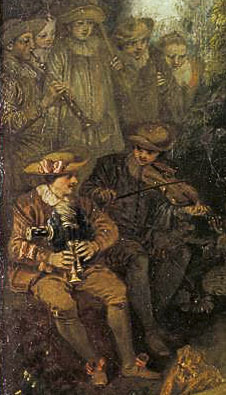 In all probability, Watteau used a different drawing of a bagpipe player for L’Amour au théâtre français, perhaps one on the next page in his albums of drawings, one that corresponded more closely to the painted figure. He probably also used this lost drawing for the bagpipe player in Le Bal champêtre. 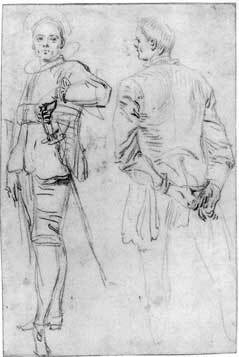 Watteau, Study of Two Actors, red chalk, 15.8 x 10.5 cm. Cambridge, Fitzwilliam Museum. The figure of the actor Crispin, standing at the right side of the picture, his hand resting on his sword, was fixed in a drawing now in the Fitzwilliam Museum (Rosenberg and Prat 197). There are only slight differences. Most notably, he holds his hat in his right hand in the painting. The same sheet from the Fitzwilliam also provided Watteau with the figure of the dancing actor seen from behind. Again there are slight differences between the drawing and the painting. In the canvas the actor has beribboned hair and a hat with a bow. His torso is more inclined. Were there additional studies or did Watteau improvise on the canvas? For this picture, the artist economically used several, seemingly unrelated studies on a page for one painting. Were drawings such as the Fitzwilliam sheet random studies selected at the time of the painting, or were they made with the painting specifically in mind? This issue frequently arises when studying Watteau's oeuvre. 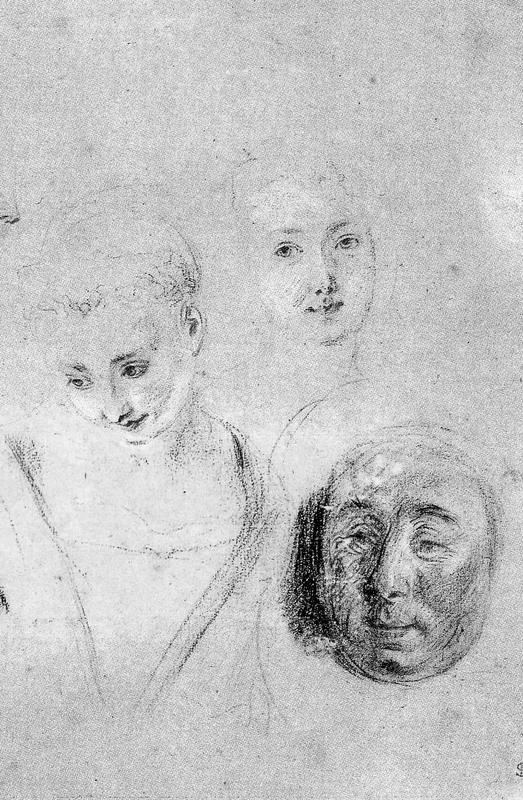 Watteau, Studies of Faces and the Bust of a Woman (detail), red, black and white chalk. London, British Museum. The assignment of a date to L’Amour au théâtre francais has proven problematic, not least because of its relationship to its pendant, L’Amour au théâtre italien. The two pictures were engraved as a pair when they were in Rosnel’s possession, only a decade after the artist’s death. And they then hung together for almost three hundred years. Until the 1984 tercentenary exhibition, few seem to have realized that the two paintings had not begun life together. 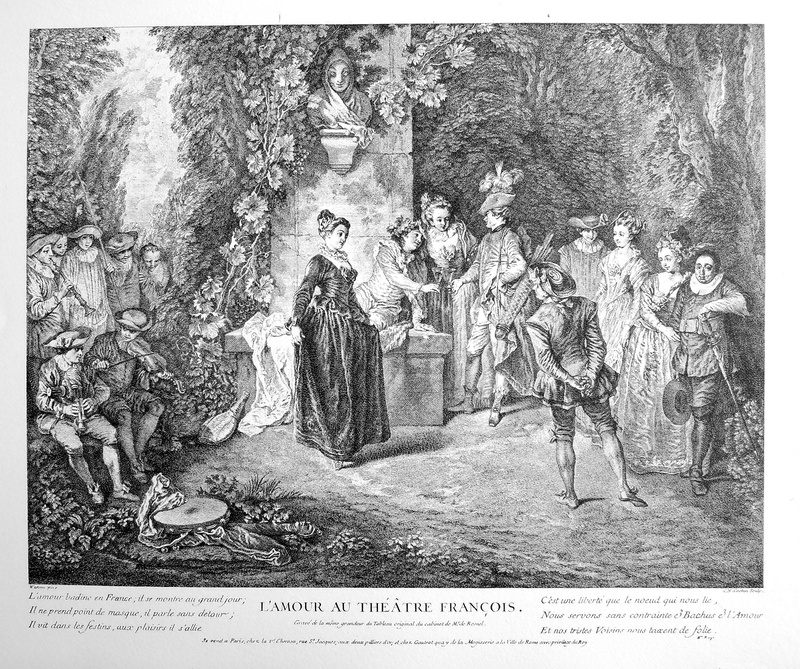 It is evident that L’Amour au théâtre français is the earlier of the two and that L’Amour au théâtre italien was created later and made to conform to the first composition. The differences between the two pictures are registered on several levels. The figural types in L’Amour au théâtre français are thinner, even scrawny, and correspond to what one encounters in Watteau’s other early paintings such as L’Île de Cythère in Frankfurt. The actress dancing at the center of the painting and certainly Crispin at the far right are somewhat larger and more corpulent than the others, but they seem to have been reworked when the artist was creating the second painting. (Indeed, Crispin also seems more tightly executed than the others on that canvas.) Not only are the figures thinner, but there are more of them than in L’Amour au théâtre italien. In the later painting, as in Watteau’s later fêtes galantes, those figures have a greater corpulence and fill the space in a richer, more Venetian way. Even the vantage point is different. In the Théâtre français we look down upon the scene whereas in Théâtre italien we look across at the theatrical spectacle. Predictably, the earlier painting is based on early drawings. The only exceptions are, as mentioned, the figures of the dancing actress and Crispin. Likewise, the later painting is wholly derived from mature studies from the model. All these differences form a consistent pattern and contribute to the inescapable conclusion that the two pictures were painted at separate moments. One can imagine a scenario in which Watteau decided to create a painting to complement his already existing picture of L'Amour au théâtre français. But when doing this, he brought his more mature skills to the fore. He painted figures that were more ample and posed more fluently, and they filled the canvas with greater monumentality. Similar shifts in style are evident between his early L'Echanteur and his later La Leçon de musique. To help harmonize these two theatrical scenes, he may well have retouched parts of L'Amour au théâtre français, notably, adding the figure of Crispin. Also, he may have modified the background of L'Amour au théâtre français. There is a sharp diving line to the right of the seated Bacchus, and all the area farther to the right is inexplicably black—in a manner uncommon in Watteau's paintings. Only at the far right do elements of lanscape reappear. Is it not possible that he darkened this area specifically to help the painting correspond more closely to the tenebrism featured in the nocturnal L'Amour au théâtre italien? The recent scientific examination of these paintings in Berlin in 2011 has produced a contrary opinion. It is maintained that a light gray base paint has been detected under both works and that this base is so particular in Watteau's work that one must conclude that the two paintings were started at the same time. Vogtherr reiterated this position in the 2013 catalogue of the Brussels exhibition. However, the changed scales of the figures in the two works, the different figural types, the different vantage points in the two compositions, and the two very distinct sets of preparatory drawings used for the pictures—each a major point in itself but overwhelming evidence in their totality—argue forcefully against the idea that the two pictures were conceived together, much less painted simultaneously. Even if most scholars generally agree that the two paintings should be dated separately, there is little agreement as to what the dates should be. Posner, for example, claimed that Watteau possibly conceived L’Amour au théâtre français as early as 1706 (undoubtedly thinking of the drawing in the Morgan Library & Museum) and that the artist painted it in 1716 at the time of the second performance of Lully’s Fêtes de l’Amour et Bacchus (about which more will be said later). However, most modern critics have come to a different, less extreme position. 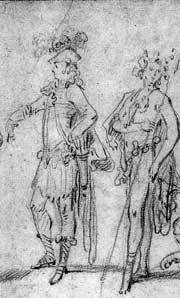 Grasselli proposed a date of 1712-13 for some of the key drawings for L’Amour au théâtre français, namely the study of Bacchus, but suggested 1713-14 for others such as the figures of Crispin and the actor dancing. Rosenberg and Prat generally preferred 1713-14 for these same drawings. Grasselli, as well as Rosenberg and Grasselli, dated the painting accordingly. Mathey proposed a date of c. 1714, for both paintings. In 1981 Roland Michel dated both pendants to c. 1718 but then (1984) dated L’Amour au théâtre français to c. 1714. Exceptionally, Glorieux referred 1712 for the main portion of the painting, but also suggested that it was reworked several times until c. 1717-18. Despite these disparities, there is a general direction of scholarly thought. Most agree that L’Amour au théâtre français was executed just a few years after Watteau was agrée at the Academy in 1712, and that it was taken up again when it was joined as a pendant with L’Amour au théâtre italien. Watteau, Le Bal champêtre (detail). Paris, private collection. 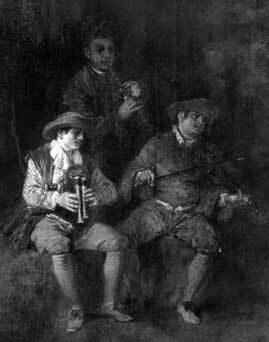 As has been noted by others, the musical trio that appears in L’Amour au théâtre français—the bagpipe (musette) player, the violinist, and the oboe (hautbois) player—is echoed by a similar group in Le Bal champêtre. The two bagpipe players are almost identical. Le Bal champêtre is a fairly early picture, whatever year is assigned to it, and corroborates the general sentiment about the early dating of L’Amour au théâtre français.